In Alexander’s (North of Here, 2012, etc.) gritty drama, a gunman’s standoff against police constables in a Canadian community has repercussions on numerous lives. Patrolling the Peacefield area, constables Grant Ambler and Arnold Strauss respond to a call of a possible domestic dispute at an apartment complex. What they find when they get there, however, is an armed man, who shoots Grant while Arnold takes cover with Daniel, a young boy who lives at the complex. The man, whom Daniel calls the General, holds the boy’s mother, Lauren, hostage in his apartment; he also seems to have a limitless arsenal, repeatedly firing out his window and pinning Arnold behind a dumpster. Meanwhile, Grant’s father, Walter, and Arnold’s pregnant wife, Joanne, anxiously watch news coverage of the shooting as Grant, lying on the ground and possibly dying, envisions himself walking in the snow with an enigmatic figure named Mike, unsure of whether or not he’s in the afterlife. 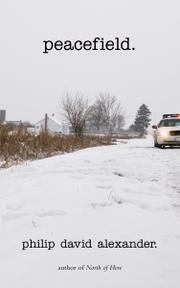 The author’s novel deceptively begins like a police procedural; Grant’s little brother, Ronnie, disappeared 10 years ago, the only significant evidence a report of a black car, and Arnold doesn’t seem to like a fellow constable because of the man’s presence during an incident initially referred to as “that night.” Though these two mysteries are ultimately resolved, the plot’s true focus is the General’s bullet-laden rampage, aptly revealing the ways in which it affects the people involved as well as their loved ones. Alexander relays the story through different points of view, from Lauren, who’s stuck with the General and doesn’t know if her son is safe, to Walter, who spends time with his adolescent neighbor Gavin (who supplies the older man with booze and weed) and learns about the shooting on TV. The characters are resoundingly developed and multidimensional. The General, for example, isn’t merely the crazed antagonist; he’s given a thorough, tragic back story as he speaks to Lauren. And Alexander doesn’t provide easy answers, particularly with regard to Grant, whose metaphysical state (he’s following Mike but is actually still wounded at the scene) is deliberately equivocal; Mike may be an angel, a ghost or simply a person who’s cropped up in Grant’s dream. There’s adequate resolution for every character before the story is over, but a few of the answers are left open for interpretation. An intense novel that expertly weaves varying perspectives of a singular, life-changing event.